If you have sold house / flat, property, land or building, also called as immovable property after 3 years then you have Long term Capital Gains and have to fill Schedule CG in ITR2, ITR3 etc. Short Term Capital Gains and Long Term Capital Gains on Sale of Property..
Capital gains arising from sale / transfer of different types of capital assets have been segregated. If more than one capital asset within the same type has been transferred, make the combined computation for all such assets within the same type. · If a property is sold within three years of buying it, it is treated as a short-term capital gain. This is added to the total income and taxed according to the slab rate. · If a property is sold after three years from the date of purchase, the profit is treated as a long-term capital gain and is taxed at 20% after indexation . · If you took property on home loan, claimed the tax deduction for the principal under Section 80C and property is sold within five years, the tax benefits will be reversed. The entire tax deduction ,for repayment of principal component of the home loan ,claimed in earlier years under section 80c , will be considered as your income (in addition to capital gains) in the year in which you sell the property. However, the housing loan interest deduction claimed under section 24(b) won’t be reversed. Long Term Capital Gains on Sale of House in ITR.. Which ITRs have Schedule for Capital Gains? 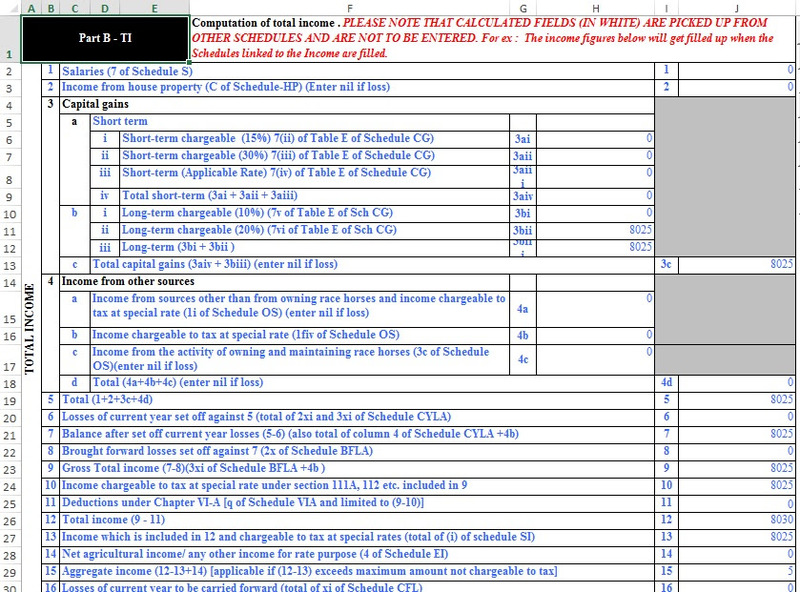 One has to fill schedule CG or Capital Gains in ITRs. ITR2, ITR3,ITR4S, ITR4 have capital Gains section. So if are individual or HUF and you have sold land,property, gold,debt mutual funds you have capital gain ,long or short, you cannot use ITR1 and ITR2A. 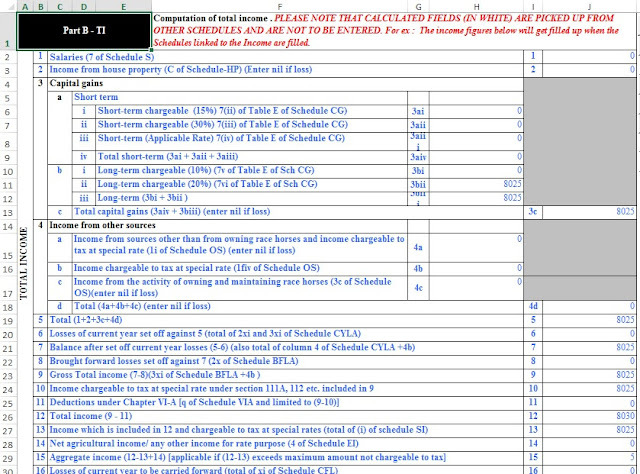 Remember when you own a house/houses you have Income from House Property.Income from House Property and Income Tax Return explains how to show house property in ITR. Only when you sell the house you will have capital gain. The schedule CG is divided in two parts. The short term capital gains and long term capital gains. The section 1 in Long Term Capital Gain,is for the reporting of capital gains on property. If you have sold a property after three years of purchase, you must fill this section. The income tax department also considers the inflation effect in your investment. It does not want to tax on the price increase just because of the inflation. Therefore, indexing is used to get the purchase cost at today’s price. Mr. Raj purchased a piece of land in May, 2004 for Rs. 84,000 and sold the same in December, 2015 for Rs. 10,10,000 (brokerage Rs. 10,000). He invested Rs. 8,00,000 in buying a new house in May 2016. What will be the taxable capital gain in the hands of Mr. Raj? · So tax on his long term capital gain is 20% of long term capital gains which is Rs. 1605. This will be shown in ITR as shown in image below. You are required to give the sale value of the property in sub section ‘a(i)’. You must fill the value of the property ascertained by the stamp valuation authority. You will get this value at the time of property registration. In the column a(iii) you are required to fill the value which is greater of the sale value and the ascertained value. In the sub section you should give the cost incurred by you corresponding to the inflation. For computing long-term capital gain, cost of acquisition and cost of improvement may be indexed, if required, on the basis of following cost inflation index notified by the Central Government . The improvement cost of property is also given with the indexation. Long Term capital gain in Total Income of ITR will show up in Capital Gains as 3bii. This is a simple case in which we are just considering Long Term Capital Gain. Actually you will have other type of income too. Computation of Tax on Loan Term Capital Gain on Sale of House is 20% of the long term capital gain.